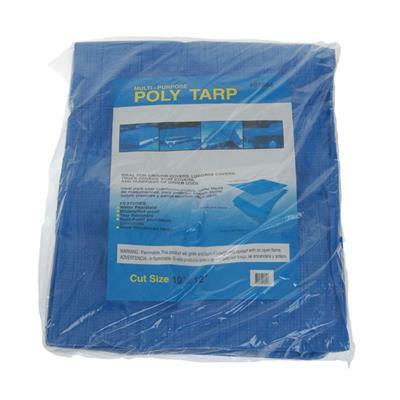 Waterproof Poly Tarp measures 10' x 12.' Provides shelter against the sun, wind, rain and snow. Versatile tarp can be used for camping, outdoor activities, shelter or disaster preparedness. Following a disaster, you may be forced to take up shelter outdoors and face extreme weather conditions. You can depend on this 10' x 12' tarp to provide protection from sun, wind, rain, and snow. Tarps can be used to build a large, secure shelter. Simply use multiple tarps along with Duct Tape and Nylon Cords to create large, effective temporary shelters. Tarps can also be for use as a ground cloth within your shelter to stay dry and away from critters. 1 tarp: 20.5" x 13" x .5"
case (16/Case):21.5" x 14" x 9"
Instructions: Can be used as an emergency shelter or ground cloth. Structural stability of buildings may be compromised after a disaster; great for emergencies or outdoors.